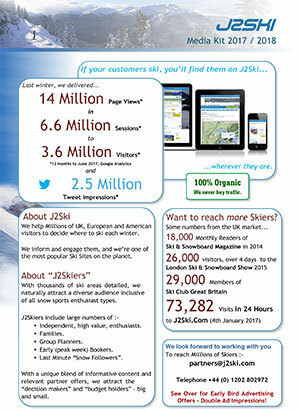 Effectively advertising a Snow Sports, Ski or Snowboard Business on J2Ski. 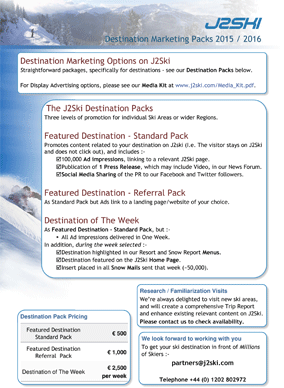 Why should I advertise on J2Ski ? Because we're one of The Most Popular Ski Sites Worldwide and for UK Skiers, consistently attracting Millions of Visitors every year. See more reasons why and our 2016/2017 Ski Season stats. How do I advertise on J2Ski ? If you're just starting out with Online Advertising, or you'd rather just leave it to us, it's easy to become one of our Subscription Partners for easy Banner Advertising and minimal outlay. If you know your CPM from your PPC then we recommend Google Adwords as the most effective way of advertising on J2Ski. If you need assistance with planning a large-scale campaign, please contact us to discuss your requirements. 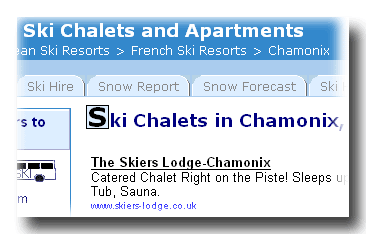 by Google for display with our Chamonix Chalets. For the most effective advertising, full control over your budget, daily statistics and easy-to-start but flexible and tightly targeted advertising. Your Google Ad will be keyword-matched to the page(s) it is displayed upon - meaning that your ads will be shown on the most relevant pages for your business. See Advertising on J2Ski with Google Adwords for more information. - Specific Pages (e.g. Snow Reports, French Chalets). Pages matched by Keyword. For the simplest possible advertising, with no long-term commitment and a set monthly budget (from just £50). Create a Partner Subscription, then just e-mail us your Ad graphics and we'll do the rest. If you offer a product or service of interest to our visitors, and can give us timely and comprehensive statistics for clicks and conversions, we would be delighted to consider working with you on a Revenue Share or Commission basis. If you are looking to build brand awareness, then page sponsorship and co-branding can be an effective approach. The popularity (number of visitors) of the page(s) required. The prominence of the sponsorship proposed. In the event of high demand for certain Ski Resort pages, we may limit the "share" of exposure for those pages. So, if there is a Ski Resort particularly relevant to your business, please contact us for a quotation.